Chocolate Custard Cake - Let the Baking Begin! Bake the cake layers and make the custard. Next day assemble the cake. Or you can make the custard and next day bake the cake layers and assemble the cake. 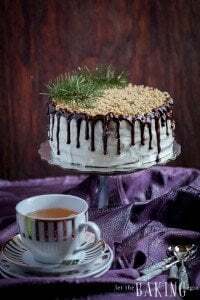 Russian Royal Cake – Simple chocolate cake with dulce de leche cream and walnuts. 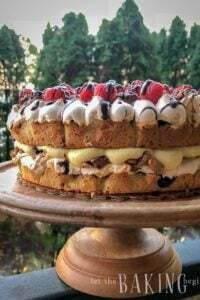 Polish Cake Recipe – Shortbread cake layered with tart jam, roasted walnuts, and crunchy meringue. 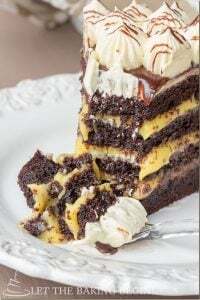 Bird’s Milk Cake – Chocolate sponge cake with a custard buttercream. Day before making the cake soak the prunes in Bailey’s. Turn the oven to 350FLine jelly roll pan (12-7/8 x 17 3/4) with foil and spray with cooking spray.Sieve the cake flour, corn starch and the almond flour together. Set aside. In a bowl of an electric mixer, whip the egg yolks with 1 cup sugar until the egg yolk mixture becomes much lighter in color and increases in volume, around 2 minutes. With the mixer running, mix the cocoa & hot water together in a cup/container and slowly pour the mixture down the side of the mixing bowl into the egg yolks mixture. In a separate, preferably stainless steel bowl (make sure that it’s immaculately clean), whip the egg whites and cream of tartar into soft peaks, slowly adding the remaining 1/3 cup sugar as soon as the egg whites start increasing in volume and became white in color. Add 1/3 of the flour mixture into the egg yolk mixture and using a spatula, fold in the flour. Do the same with the rest of the flour. Now in 3 additions, fold the egg whites into the egg yolk mixture. Pour 1/3 of the mixture into the prepared pan, making sure to distribute the batter evenly throughout the pan. Bake 2 more layers using the same method. Let cool. Take off the foil and cut the cake down the middle, making 2 equal parts. Mix the water and sugar in a medium size saucepan and let it come to a boil. Let cool. Add liquor and mix thoroughly. Pour milk into a large pot. Split the vanilla bean lengthwise and scrape out the seeds with a knife. Add the seeds and the vanilla pod into the milk. Let the milk come to a boil over medium heat. While keeping an eye on the milk, in a separate bowl mix the corn starch, sugar and salt. Add the eggs and mix until smooth and no lumps appear. Continuously mixing the egg and corn starch mixture, slowly pour 1/3 of the hot milk into it (this is called ‘tempering’). Slowly pour this back into the boiling milk, all the while continuing to whisk. Let it come to a boil and cook for another minute. Take out the vanilla pods out. Add the butter and let it completely melt. Cover with saran wrap so it touches the custard. Let it cool at room temperature and then transfer to the fridge for it to completely cool down. Remove the prunes out of the soaking liquid and cut them in small strips. 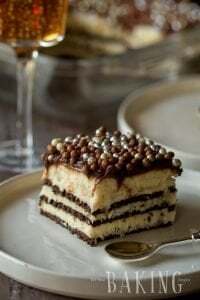 Place the first cake layer in the middle of the serving platter. Place 4 strips of foil/wax paper/parchment paper under the edges of the cake, over-lapping each other (makes for easy clean up, once you’re done). Using a squirt bottle, soak the cake with the simple syrup, quickly going back and forth along the cake (you can use a brush to do the same. just soak the brush in the syrup and dab on the cake). Put 1/6 of the custard on top and spread it around. Take 1/6 of the strips of the prunes and evenly distribute them throughout the cake layer. Repeat the above steps of assembly with the rest of the cake and frosting. Cover the top and sides of the cake with leftover frosting. 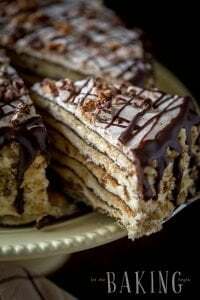 Use almond slices to cover the sides of the cake. Slowly take out the strips of foil/wax paper from under the cake and discard. Hi, Marina. I started making your recipe and got confused by directions about sugar. The Ingredient list states there should be 1 & 1/3 cups for cake layers. When you ask to mix sugar and egg yolks, no quantity of sugar is listed, so I assumed it was all 1 & 1/3 cups, but then when making egg white mixture, it says to “add remaining sugar.” Remaining from what? I would be happy if you clarify this for me. 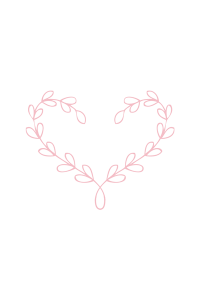 Thank you very much in advance!!! I have edited the recipe to clarify. You add 1 cup with the egg yolks and then 1/3 with the egg egg whites. I have done it where I added all sugar with egg yolks without separating and that worked fine too. Какое какао ты использовала? For cakes or for drinks? For cakes, it usually says “natural, unsweetened” on it. Please see the instructions for the bailey’s syrup. I believe it’s missing the amount of water needed. I think I got these plates at Pier One Imports, about a year ago..
oh goodness! all these yummy desserts you have!